While many people I know talked about the TEA Parties in Washington, D.C. and Atlanta, I was focused on our local TEA Parties because that’s where the real change and momentum will come from. The local communities. You can’t change things on a national level if you ignore the issues in your own backyard. 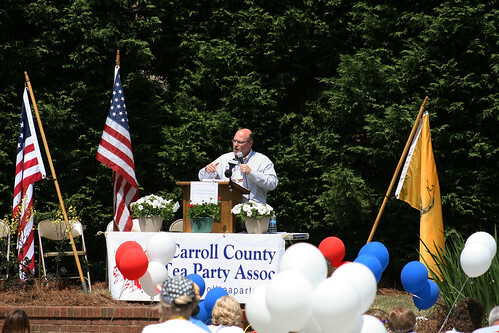 I had several things that I needed to get done today, but I made sure to stop by the Carroll County TEA Party. They had a great lineup of speakers for the event, and I’m glad I took the time to participate even if I wasn’t able to attend the entire event. 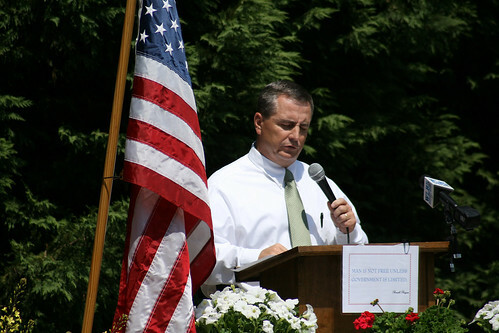 I arrived as Gerry Purcell, Republican candidate for Georgia Insurance Commissioner, began his speech. I’ve been wanting to meet him in person for a couple months, and it was awesome to get that chance when he concluded his speech. He even made sure I got a yard sign, which is now standing proudly in my front yard. The next person to take the stage was Dr. Deborah Honeycutt, who is running for the Georgia District 13 Congressional seat. 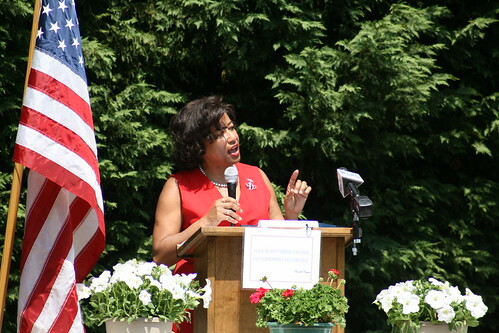 I thought her speech was great, and she did a good job energizing the crowd when she spoke about the Fair Tax. Dr. Honeycutt has been on my radar for a couple months now, and my only regret is that I don’t live in her district (not that I would trade Rep. Phil Gingrey anyway). Carroll County Sheriff Terry Langley followed Dr. Honeycutt, and he delivered another great speech about the last line of defense being local law enforcement. When Sheriff Langley wrapped up his speech, I needed to head back home. I still had a couple things I needed to get done, and it was getting hot. I didn’t want to make my headache any worse than it already was. I posted more photos on my Flickr account, if you want to see them. The Douglas County Instant TEA, which was held at the corner of Chapel Hill and Douglas Blvd. was another instant “hit”. 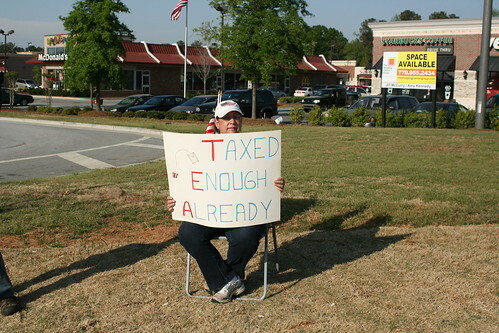 A small group of TEA Party die-hards (including myself) met on the grassy knoll to remind people that we’ve been Taxed Enough Already. While many people were focusing on the larger events held in large cities, others were making sure the message was getting out at the local level. The very place it needs to be sent. When all is said and done at those larger TEA parties and people drive 20, 30, 50, or even 100 miles to get home, what message was sent to the people who stayed home in their communities? 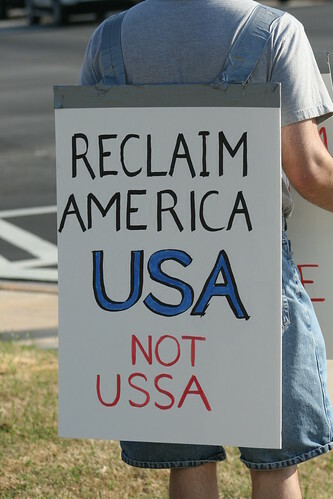 How many of their neighbors got the message from that grand TEA party in downtown Atlanta? While they were attending those large parties, hundreds, if not thousands, of their fellow hometown citizens drove down their local roads on their way home from work. Our group may have been small today (you can see more photos at my Flickr account), but we carried a loud message, and based on the people honking and waving their support I’d say we got the job done. 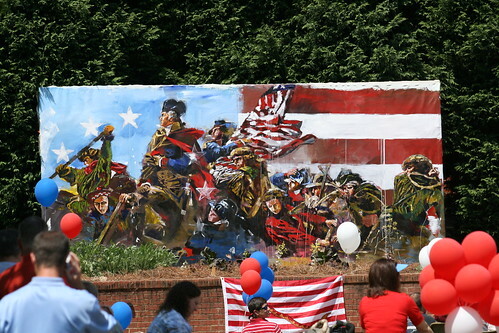 I hope everyone else had fun at their big city TEA parties, because we had a blast here on the homefront. Back to our roots is where we need to be.